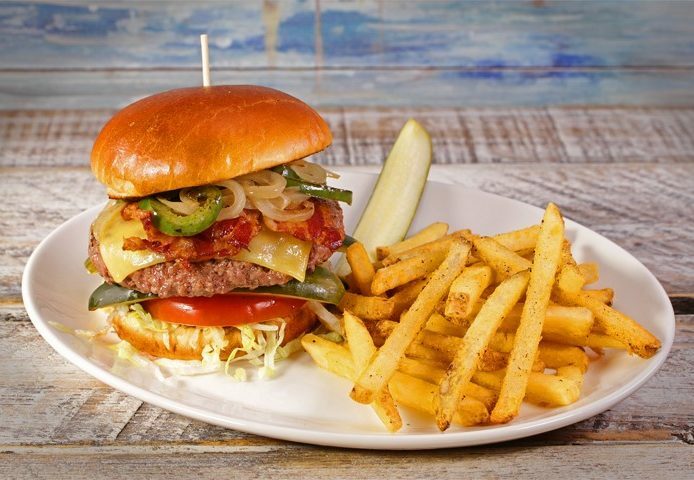 Celebrate National Hamburger Month with a limited time offer at Margaritaville Restaurants – the Philly Swiss & Bacon Burger! Only available for the month of May, this fan selected burger was developed by our Manager in Panama City Beach, Patrick Grimes. If you plan on visiting the Margaritaville Hollywood Beach Resort in Florida, make sure to try out the re-introduced “Come Monday” drink special only available for the month of May! This frozen concoction is a combination of a Strawberry Daiquiri, Piña Colada and Blue Curacao. Need Some Grilling Inspiration? If you like your burgers with all the fixins, you’ve come to the right place! We say everything is better with bacon and these BBQ Bacon Ranch Sliders don’t disappoint. Looking for a tropical touch? Our Calypso BBQ Turkey Burgers are just the taste escape you need this spring. If you’re feeling a little wild, top your burger with Jammin’ Jerk Shrimp and bring on the heat! 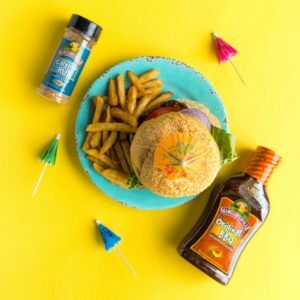 Save $1.00 on Margaritaville BBQ Sauces, Rubs, Dressings and Shrimp with these printable coupons. Paradise is in your own backyard! 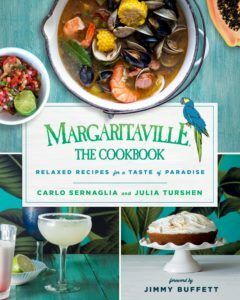 Margaritaville: The Cookbook is filled with all of your favorite recipes that bring bursts of island flavor straight to your home. easy-to-prepare, relaxed recipes from fan favorites such as Volcano Nachos to tropical specialties like Lionfish Carpaccio. The book will be available in hardcover and e-book versions beginning May 1, 2018. Use Promo Code: BURGER through the end of May to get a $50 food and beverage credit and complimentary self-parking for one vehicle when you book 2 or more nights. Rates start at $299. The offer is available for stays Sunday-Thursday in all room types. *Offer valid at participating Margaritaville Restaurant locations including Atlantic City, Biloxi, Chicago, Cleveland, Destin, Hollywood Beach, Key West, Mohegan Sun, Myrtle Beach, Nashville, Panama City Beach, Pigeon Forge, Syracuse, Las Vegas, Mall of America, San Antonio and Tulsa.